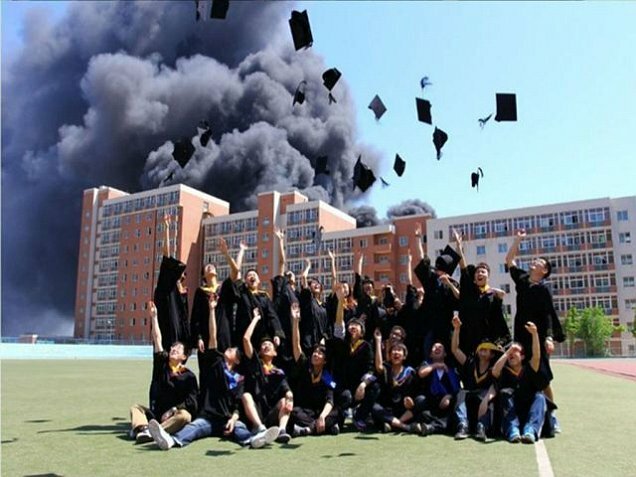 University staff at the Dalian University of Technology said they were disappointed that students went ahead with the traditional square hat fling graduation photo while a campus warehouse fire blazed in the background. Though when I studied at the University I was lit up by the warmth of the teachers and students alike. As if life wasn’t awful enough, an English language training company recently posted a job advert at a Wuhan University that precluded Scorpios and Virgos from applying. The “moody and critical” zodiacal outcasts were deemed unsuitable for the roles as teachers and clerks. Full story on the Telegraph. On the plus, these very characteristics should surely make them top candidates for other types of employment – for example if the nearby Nanjing Forestry University is still recruiting “Red Armbands” to curb inappropriate displays of intimacy on campus. Here at Brushduck we are firm believers in equal opportunities, but if anything favour contributions from predatory arthropods and virgins.